This White Paper is, as it ought to be, full of tension between history and geography. There is much to be said for the analysis in the government’s new Foreign Policy White Paper. It wrestles with all the general questions that should be exercising the minds of Australia’s policy-makers in this era: America’s troubles, China’s rise, the kind of regional order Canberra seeks, the forces of protectionism and nationalism that are upending politics in Europe and the US, and the strain these factors are placing on the international system. The White Paper realises the limits of Australia’s power but is confident about the nation’s underlying strengths as it tackles a rapidly changing environment. For all the repetition of ‘uncertainty’ in this document – the word itself appears no less than 11 times in the first 30 pages – Australia has dealt with periods of ‘uncertainty’ before. In the wake of the Second World War, when Australia expected the European empires to flood back into the region, it had instead to deal with the rise of Asian nationalism and the decolonising wave; in the late 1960s, having clung tightly to the embrace of its ‘great and powerful’ friends, it had to face the sudden collapse of its Cold War policy designed to keep the Americans and the British engaged in Southeast Asia. Look back at the speeches and statements of Australian leaders in those two periods and the same mantra of ‘complexity’ and ‘uncertainty’ populates their rhetoric, too. These periods were deeply unsettling but Australia found a way through. And yet it is impossible not to face squarely the novelty of the current circumstances: a US in relative decline and an ascendant China that looks, ultimately, to set the rules in the region. The White Paper wants the US to rediscover its exceptionalist impulse – the government is almost willing it to happen – but realises at the same time that America's ‘long dominance’ is under challenge and further that China ‘may exceed’ American power and influence in the Indo-Pacific. The key line is that ‘as China’s power grows, our region is changing in ways without precedent in Australia’s modern history’. The paper necessarily carries the stamp of its minister. And herein lies the essential contradiction at its heart. Bishop’s speeches have been positively littered with the theme of ‘uncertainty’ – it is her watchword - yet she is resolute and absolute about the endurance of American regional leadership. The Trump phenomenon is a prime cause of this turbulence – by no means the only one - yet Bishop believes it will pass and that the status quo ante will somehow be re-established. It is difficult to know why the Minister has allowed hope to dictate to judgment. Sure, neither a speech nor a White Paper are the place to berate Trump or indeed labour America’s travails. The US may well recover; the question is how long that might take, to what level and how much further damage might be done to its credibility and prestige in the meantime. 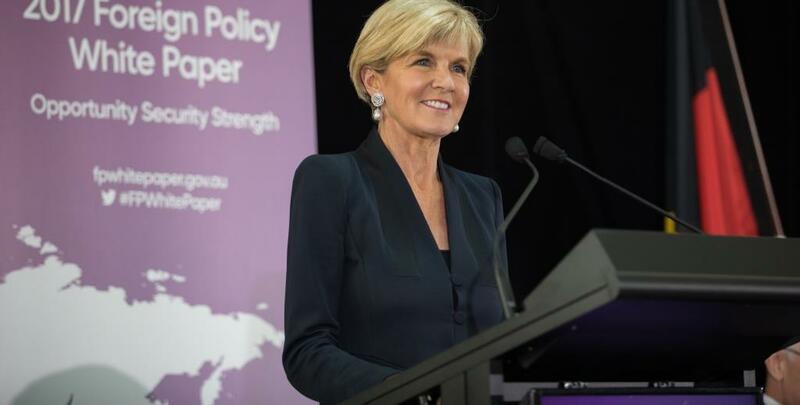 But it is a fair bet that Bishop’s blithe assurances that the US will recapture its global and regional leadership role are not necessarily shared among all the serious thinkers in the Canberra policy and intelligence community. Both Bishop and the Prime Minister are yet again appealing for the return of a Cold War America. Indeed the Minister’s public pronouncements – especially in the wake of this paper’s release – are starting to resemble the pleas that Harold Holt made to the British government in 1967 following the announcement of its intention to military withdrawal from East of Suez. Holt too made a point of appealing to British pride in its world role. Remaining in Asia, he said, was ‘in Britain’s own interest’. But no one in London was listening, mainly because the economic sands had shifted so quickly beneath Britain’s imperial footprint. The point here is not to mindlessly equate the British position then to the American one now; the US is not retreating from Asia. But Washington has been unable to change the unilateral facts on the water in the South China Sea; has a Pacific navy that is tired and accident-prone; and is now failing to drive the broader regional economic agenda. It is surely not a matter of simple coincidence that the White Paper’s glossy cover does not feature any part of the map of the continental United States. US officials will like some of the tougher language in the paper on China but they will surely note the view that military modernisation in the region is not seen as a threat to Australia. Some US observers may also tire of Canberra’s continued reluctance to conduct its own freedom of navigation operations through the 12 nautical mile zone of disputed territory. As one of Obama’s White House policy staff told me recently, ‘Australia is a great ally of the US everywhere in the world, except in Asia’. In a mark of continuity with the Howard era, the White Paper also assumes that Australia can continue to ride both the US and China horses simultaneously. That framework still works, in essence, but it is going to get much harder for Australia to be able to pull this off over the next decade. Trump will complicate it, as will his likely successors, from either party. Accordingly, the White Paper does not put all the eggs into the American basket and recognises the need for Australia to pursue deeper relationships with the region's democracies. That’s a virtual green light for more meetings of the much-vaunted 'Quadrilateral Security Dialogue'. The Quad’s more nuanced proponents speak of it as nothing more than a harmless chat among like-minded friends with a suite of limited cooperative endeavours – nothing harmful in that. Its more vigorous advocates hail it as a strategic alliance in the making, aimed squarely at China. This White Paper is, as it ought to be, full of tension between the pull of history and the imperatives of geography, between the world as it is and the world Australia would like to see. The authors know, however, that history has surprises up its sleeve. They acknowledge that the forces buffeting global politics may have consequences that are both unforeseen and uncomfortable for Australia. So for all its occasional caution, this document contains some stark messages that should deliver a necessary jolt to the national imagination. President Trump’s first visit to the UN General Assembly this week will indicate whether he intends to promote America’s global engagement or double down on America first. Britain can learn from complex challenges faced by an Australia that is economically dependent on China. Trump–Kim summit: what’s in the venue? Singapore, Panmanjom, Ulaanbataar, or anywhere else, deciding where the leaders meet will broadcast an important signal.